Isn’t that a great bracelet? I had a really hard time choosing one to feature here. 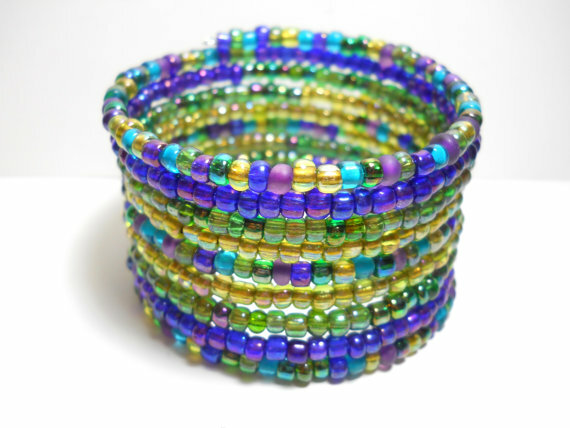 The shop is WrappedandSnapped on Etsy and the artist, Jennifer, has so many cool bracelets to choose from! She has a flair for mixing colors and textures, and that’s not even mentioning her braided cuffs. Seriously, you need to go look – these are great for school, for gifts, and like I said – just for fun! 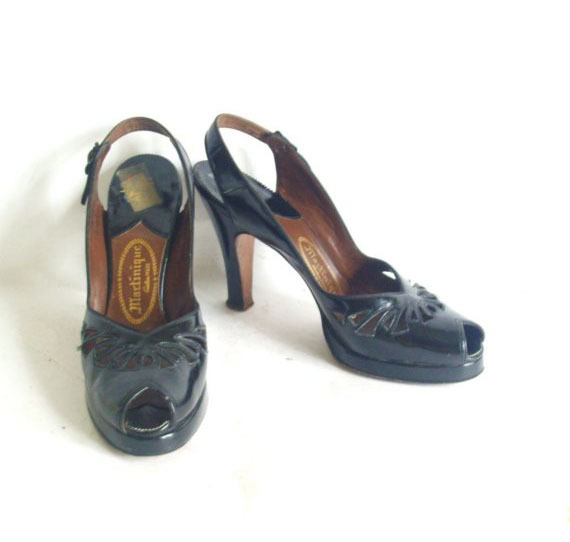 Vintage 1940s Shoes ooh la la! Holy toledo, take a look at these shoes – talk about girly and gorgeous! Now that’s what high heels are supposed to be. Attractive, interesting detail, great 3″ heels that are NOT so high you can’t walk in them. A platform to give you a bit of extra height but not a ridiculous, silly platform that some shoes have that we won’t talk about. These actually look comfortable! And I mentioned gorgeous, right? Imagine the dinner date you’re having while you’re wearing these. Go find them at VintageAccessories4U on Etsy. If they are already sold, believe me you’ll find lots of other cool goodies. Did I mention the red leather combat boots? See what I mean? I tried a few “insert Tab A into Slot B” (without actually inserting) – these are simple but effective. 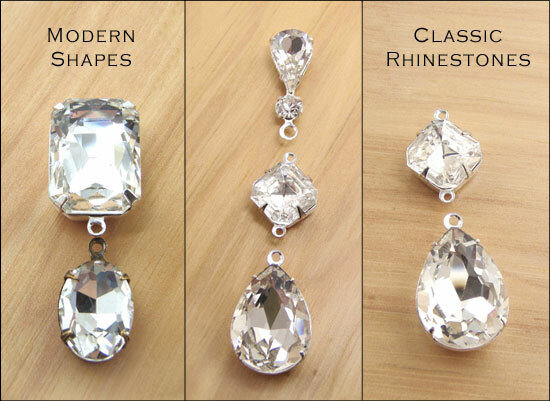 I’ll probably post a few more complex styles too – but I wanted to show that clean designs, and simple shapes, can combine to make some very cool earrings without you having to invest a lot of time – or money, for that matter. 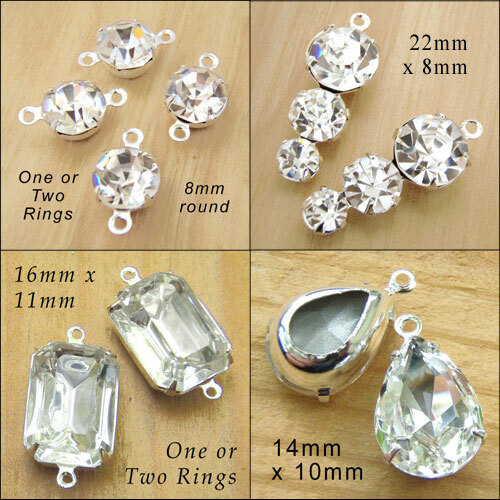 If you’re a jewelry designer, or simply making gifts for your loved ones (or yourself) you really can’t go wrong with crystal rhinestones. There’s a reason they call them “classics”. Gorgeous vintage dress – and did I mention cleavage? All right, yes, that was just a teaser. Because this is a girly and gorgeous dress – and there’s no cleavage. The whole thing that caught my eye about this dress is that it is pretty, and flattering, and if it’s your size it would look good on basically everybody between about 14 and 84. Yes it would look different on those two females – but think about it, it would look GOOD. And the thing is, sometimes for one reason or another you need something classy and dressy that is modest. Maybe you’re trying to impress his mom (or give her a snow job, what do I know). Or to wear to your very conservative office party. Or something. But you still want to look good. Well – here’s your dress. It’s available at Lucky Dry Goods, a vintage shop on Etsy. And may I just say, that if this delectable garment is already purchased, when you go to check? There are many irresistible vintage finds just waiting for you to pounce. Did I mention the Black velvet dress from the 1930s or the gold lurex pantsuit that Alfred Hitchcock would totally have used in one of his films? But you will know. Gorgeous and interesting. The “affordable” part is just a perk. 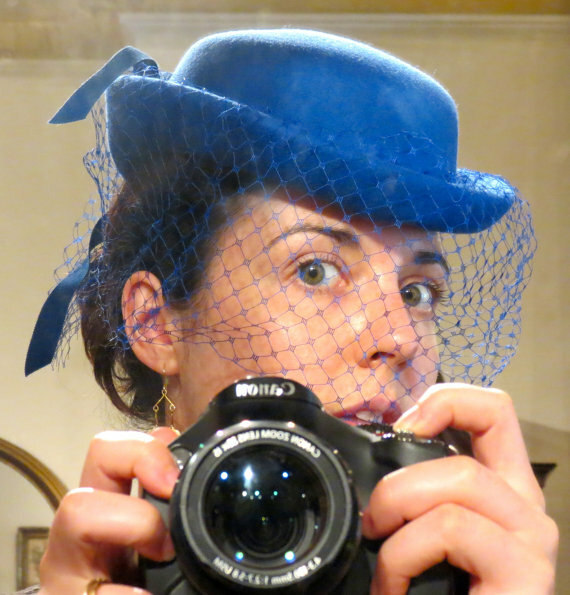 If this lovely hat is gone when you go to visit, believe me there are many more wonderful treats to find at Semprevintage on Etsy. It’s that kind of (wonderful) shop. The owner, Anna, has the good sense to give lots of detail and photos. Her shop is, well, fascinating. You’ll see what I mean. Go peek! P.S. And by the way, did I mention the vintage wedding dress I loved? She has a vintage bridal category – in other words, she is always looking for more vintage wedding dresses and accessories! You know that’s what you’ve been looking for! These aren’t colors I would normally use together – and yet, I like what I’ve tried here. Peach, and deep purple amethyst, and peridot green, in one dangling earring? Well, why not? Warm smoky topaz, jonquil yellow, emerald green, and amethyst? Sure. 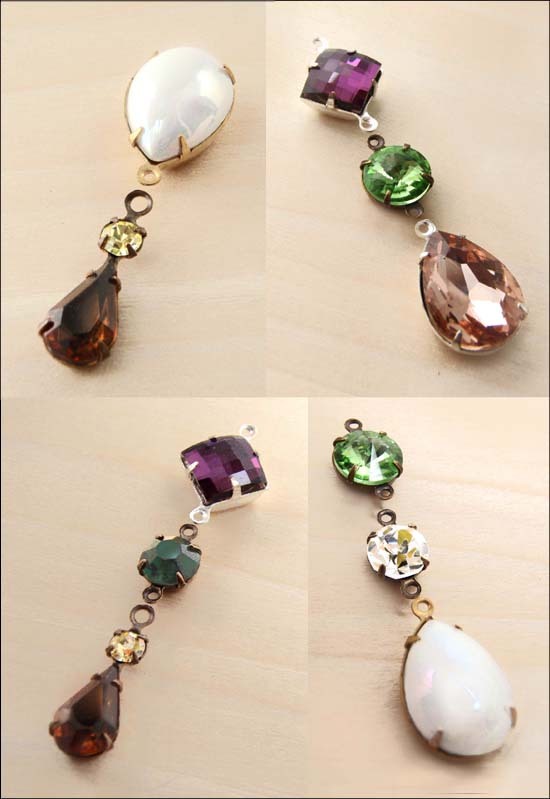 Warm smoky topaz, jonquil yellow, emerald green, and amethyst. Why not? I guess the real point here is – take out your bead soup, or uncover it from when your husband came in the workroom and you didn’t want him to think it was all a Mess. Play with different, unusual, fun combos. Try stuff. You’ll find out some things look good together that you never expected – and sometimes, you’ll make Art. 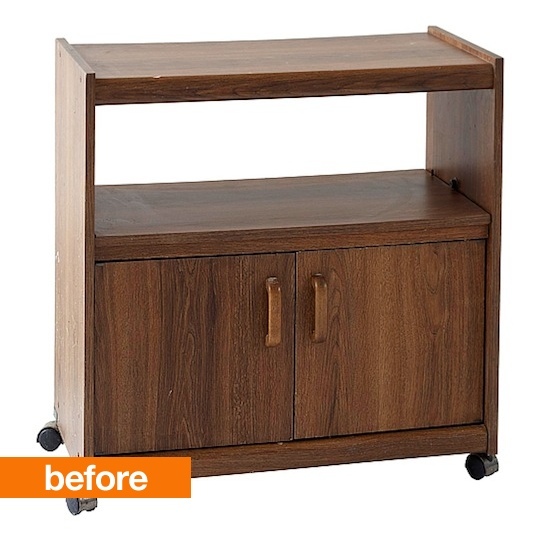 From something you’ll find for free on Craigslist, or maybe $3.00 at a garage sale – an old TV or microwave cart. And with a small amount of work – cleaning, a bit of paint, some wallpaper or other patterned paper (recycled magazine pages? wrapping paper?) – maybe some drawer pulls – presto! 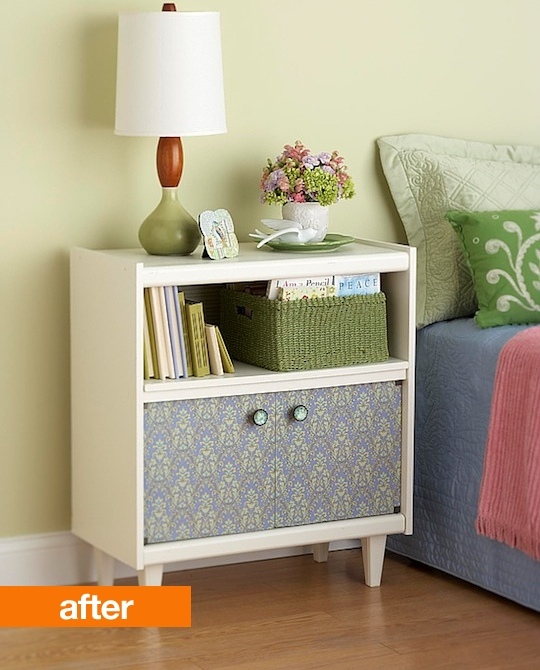 You have a charming, attractive, useful new piece of furniture that you’ll be proud to call your own! 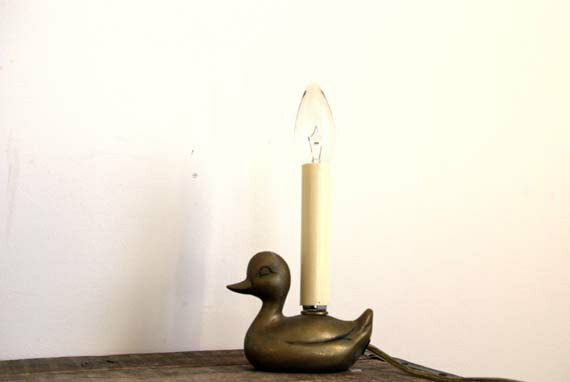 Yes, this is a wonderful vintage find for you home, rather than a sparkly pretty thing to wear. But it’s something you could see every day, and it will make you smile, and it’s vintage, so these are good things. You see my point, yes? This little fellow has such charm that he’ll give you a bit of happiness whenever you sit down at your (thrifted or Craigslist or Thonet, for that matter) desk. And if he should happen to be sold when you go to find (and buy) him, the shop owner Bonnie at VintageRingo on Etsy has many fun and adorable finds. Go peek, you’ll see what I mean! P.S. Besides: VintageRingo. With such a wonderful name, how can you resist!